Yesterday we left El Calafate for El Chaltén, about a two hour drive to the north. 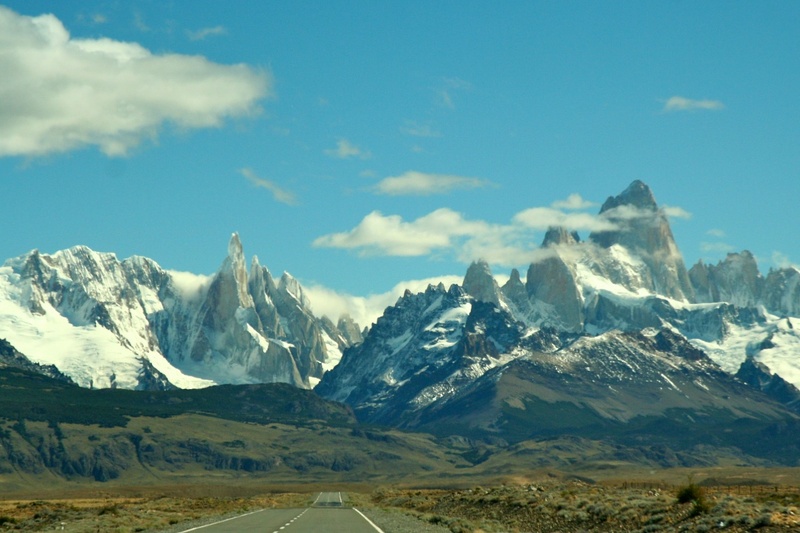 As we approached El Chaltén we were mezmerized by this view of the mountains (the photo is a little blurry since I took it from the passenger seat while the car was going almost 80 mph). El Chaltén is the indians' name for the mountain later renamed Fitz Roy, arguably one of the most spectacular peaks in the world. 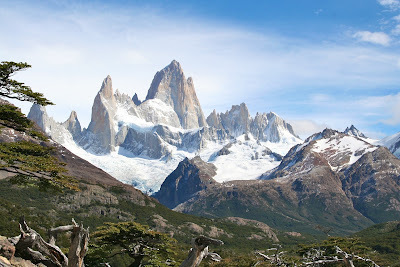 The town (300-400 permanent residents) is located right at the base of Fitz Roy, and is a mecca for hikers and mountain climbers from all over the world. If I hadn't taken this picture myself, I would think it's a fake. On the left side of the photo is a group of spires called Cerro Torres. My first thought was that all great cathedrals try to look like this. The tallest peak on the right is Fitz Roy. After checking into our hotel (Los Cerros) we hiked up to a lookout point to see Cerro Torres better, but the sun and overcast sky conspired against us and the pictures weren't very good. Today our luck was running strong, and by the time we got to the lookout point for Fitz Roy, conditions were nearly perfect, as you can see in this photo. I can say flatly that this is the most impressive, sublime, and beautiful view I have ever had the pleasure to see in my lifetime. 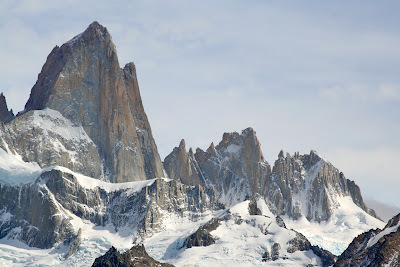 This last picture is a closeup of Fitz Roy. Note how the colors change according to the clouds and the sun. I could have spent the entire day admiring the view. The hike to get to this point took us about 1 and a half hours from the hotel (an elevation gain of about 1000 feet and about 4.5 miles), and it was not extremely difficult. This is definitely something to add to your bucket list. I've seen some gorgeous places (Yosemite, Iguazu Falls and the Matterhorn come to mind), but this one is tops. Oh, and there is a glacier that comes down off of Fitz Roy into a lake (which you can't see from this vantage point). Tomorrow morning we travel back down south to Chile's Torres del Paine National Park (just south of El Calafate, but about a 4-5 hour drive), and we are told that it is just as beautiful as all the other wonders we have seen so far. There are no phones or internet at the place we are staying, however, so I'll be out of touch for the next several days. Well, if Grannis hadn't vouched for the photos, I would have also said they were fake. What scenery. Why am I here working? Amazing pictures. Love your posts with the descriptions, Mr. Grannis. wow. thanks for the new desktop pictures. pretty amazing. Wow! I have only seen the Andes from 35,000 feet! For since the creation of the world God's invisible qualities-- his eternal power and divine nature-- have been clearly seen, being understood from what has been made, so that men are without excuse.